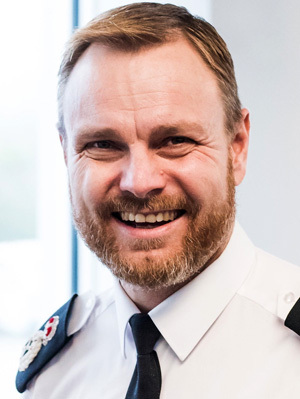 Matt Jukes was appointed Chief Constable of South Wales Police in January 2018. Matt joined South Yorkshire Police in 1995 before going on to work in a number of roles, principally as a detective. He worked for the forerunner of the National Counter Terrorism Policing network and. Matt remains involved strategically in counter terrorism. In 2006 Matt returned to local policing as a divisional Chief Superintendent in South Yorkshire. He joined South Wales Police as an Assistant Chief Constable in 2010 and was appointed Deputy Chief Constable (DCC) in August 2013 where he had the task of leading a force change programme. A focus on local policing and a rigorous programme of back-office reform has supported one of the smallest front-line reductions in the UK with South Wales Police recently assessed as the most visible force in England and Wales. Matt is a member of the Prince’s Trust Advisory Council in Wales and has a leading role in work on tackling Adverse Childhood Experiences. He leads on the recruitment, retention and wellbeing of investigators for the National Police Chiefs’ Council and is chair of Police Sport UK. Matt was awarded a Queen's Police Medal in the New Year's Honours List 2018.